Below are some of the resources we recommend to women, girls, feminine identifying and non-binary people with disabilities. We have provided accessible versions wherever possible. If you require another form of any document, contact us. Resources produced by WWDACT for our community. ADACAS has developed a website and toolkit for people who need support to participate in decision making. This enables people with disabilities to be involved in decisions about their lives. WWILD has created these resources to assist women with intellectual and learning disabilities who have experienced sexual abuse or been victims of crime. 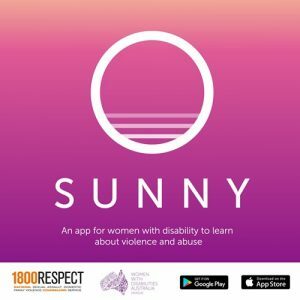 Women with Disabilities Australia and 1800RESPECT worked together to create Sunny, and app that helps women with disability to learn about violence and abuse and seek help. It is compatible with screen readers and magnifiers on Android and iOS.